Another case of the cover art being scarier than the film. 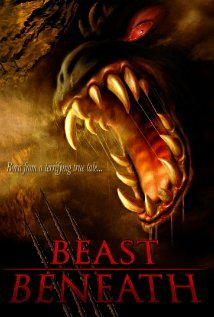 If you’re in the mood for a low-budget, slow-paced monster matinee, I guess you could do worse than Beast Beneath. But you’d have to try pretty goddamn hard. Seated beside a campfire, a father tells his bored teenage son the true (?) story of Griffith Park (their present location) in Los Angeles. Seems the family that once owned this prime piece of real estate was cheated out of it by a trio of unscrupulous douches. The offenders and the land itself are cursed, and now the ghost of the family patriarch and his demonic dog haunt the premises. Sounds good on paper, but Beast Beneath never transcends the restraints imposed by its humble budget, and instead of inspired amateurism, we merely get amateurism. Of note to followers of “Where Are They Now?” trivia. Jimmy Buffet-esque one-hit singer Bertie Higgins (“Key Largo,” 1982) cowrote and stars in Beast Beneath. His son Julian is the director. Hope they didn’t sink their own money into this project.